Use the code PCG to save 20% on tickets. 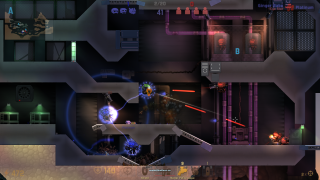 Oxeye Games’ Cobalt was a bunch of great ideas in a gorgeous little package, and the team is back with a more refined and developed idea—Cobalt WASD. Daniel Brynolf and Pontus Hammarberg will take to the stage during the PC Gamer Weekender next month to discuss Cobalt WASD, explaining how bringing mouse support to Cobalt turned it into an entirely new game, and what this process has taught the studio about making the perfect PC-centric platformer. They'll be on the Developer Stage at 13.00 on Sunday, 18 February. But it won’t just be a stage presentation for Cobalt WASD. No, the game will also be available to go hands-on with throughout the Weekender, meaning you too can get involved in some teleporter gun-toting, grappling hook-shooting, sticky sentry turret-placing quick tactical thinking action. You can find more details on Cobalt WASD on its official site, and keep up with Oxeye Games over on Twitter if you’re after more up-to-the-minute news. As well as Cobalt WASD, you’ll also be able to see many more speakers, games and booths all at the PC Gamer Weekender, which is being held February 17-18 at the Olympia, London, in the UK. For more details see the site, and follow us on Twitter for up-to-the-minute news. Tickets are available now from £12.99. Use the code PCG to save 20% on tickets.